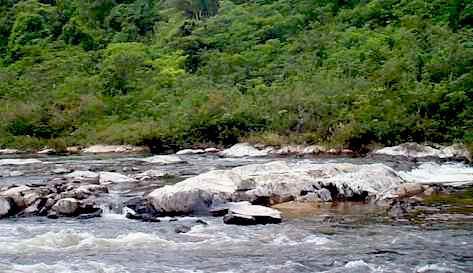 MYSTERIOUS SEDIMENTS PLAGUING THE MACAL RIVER? WHERE DO THEY COME FROM? Since the start of the rainy season several weeks ago, and the resulting higher stream flow on the Macal River, there has been speculation that the sediment that has been plaguing the river and accumulating on the rocks, especially the black slate formations, would be washed off and they would return to their former beauty once again. But, as the waters receded, the reverse was true. Not only did the former sediment NOT wash away, but there is an additional layer of white deposit over everything. This is the first time this condition has appeared on the river, and it raises concerns that it indicates some type of man-made pollution. Of further concern is that this will further exacerbate the problems with skin rashes some people have experienced from using the river, and impose other health hazards as well. Anyone using the Macal River for their water supply should be notified, and their filtration systems monitored carefully. There is also the concern of what affect this type of sediment could have on the reef system. ....and there could be a number of others. It is hoped the proper authorities will assess the situation quickly, and see if it does indeed hold potential hazards to area residents, visiting tourists and to our irreplaceable reef system. The two photos attached show clearly the reason for concern. The picture at the bottom is of the Black Rock landmark, normally pure black slate with small white-water rapids flowing around it. Now it is hard to discern which is water and which is sediment-coated slate. The close up shows how completely coated the rocks have become. If there is white sediment visible up at Guacamallo Bridge, then the problem cannot be from Mollejon. 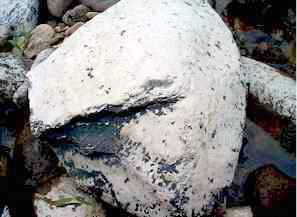 If there is no sediment there, then it more than likely is caused by Mollejon.